Wilderness Retreats — Annamieka: Artist. Let's Bring Your World to Life. 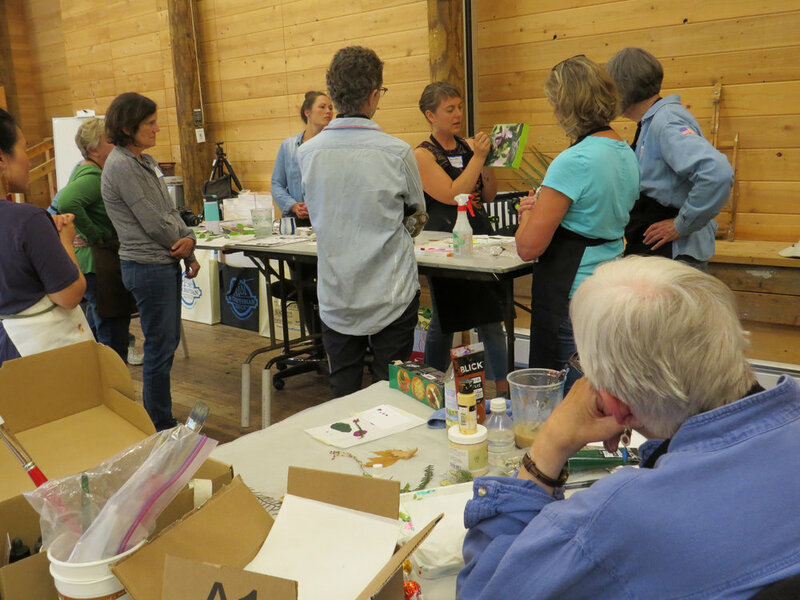 In this one-day workshop, we will dive right in and make multiple small paintings, learning to layer color and imagery with paper, paint, pens, and pencils. Responding to Sitka's spectacular setting, imagery of local flora and fauna will make their way in between abstract layers. Artists of any level will be reinvigorated by this playful workshop experience. 2019 Note: My annual Sitka Center workshops are typically 3 days, but in 2019 I will be having a baby so we have adapted the workshop format to a one-day deep dive - it's going to be fun! Surfaces - Small cradled wood panels to paint on. 8”x10” or 9”x12” wood panels work nicely. You’ll want 4 or more wood panels for our day of painting. Paint - I will provide paint but if you already have colors of acrylic paint that you love, bring them. Palette – this can be anything. A tupperware lid or an old plate works well. Collage medium - acrylic gel medium, acrylic matte medium, or mod podge. Collage paper - 5-10 different decorative papers that you find beautiful. Water-soluble pencils. Two water-soluble pencils - I recommend black, and white. My favorite kind is called the Stabilo “all” pencil. But any water-soluble or watercolor pencil will work. Paint Pens - At least one fine-tip acrylic paint pen for drawing detail. If you only buy one color, buy a white paint pen. Posca and Molotow are my favorite brands of acrylic paint pens. Any of your other favorite pens and pencils, and a pair of scissors. A wide range of acrylic paint colors for students to try. It always such a joy to teach and paint alongside my fabulous Sitka Center students. I hope that you enjoy this collection of photos and art created by participants in the workshop held June 29 - July 1 2018 at the Sitka Center for Art & Ecology. Consider joining us in September 2019 for my “Layers of the Forest” workshop! Note: Kudos to the staff at Sitka Center for providing several of the images above. If you’d like to view the full gallery, please visit the 2018 Layers of the Forest Workshop Flickr Page!